Why is that tree blue? 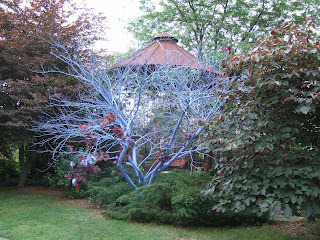 I was there in a flash to check it out, and yes, the tree was a beautiful soft cerulean with a hint of violet. I was elated. Not only did the owner take my wild proposal seriously but he actually went to the paint store with a chicory flower so he could get exactly the right shade of blue. It was the color of the sky on a perfect day. It complemented the green of the grape vines, and the deep red of the ‘Forest Pansy’ leaves it rubbed up against. It emphasized the elegance of the recently demised redbud’s structure. It was startling and mystical. Tell them “Blue represents expansiveness. Imagine blue light waves being absorbed by the gas molecules in the air and radiated in all directions.” Or say “The blue brings out the grace of the tree’s form … when was the last time you really looked at a tree?” Tell them “We are honoring that tree for its 20 years of service, removing carbon dioxide from the air.” Or, explain that it’s an extremely rare Arboreum ceruleum. Do this with a very serious expression. It was my suggestion to paint the tree chicory blue. But, I confess, the idea was borrowed from the gardeners at the Swarthmore College campus, who may have borrowed it from some other garden. No matter, inspiration should be spread around. The Swarthmore tree lasted a couple of years before it faded and was chopped down. For two years it compelled people to stop and look and wonder. 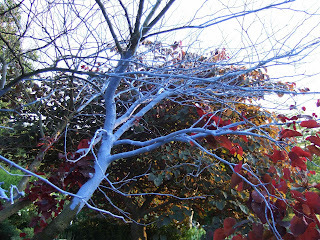 Some actually asked what sort of tree it was, that had bark of blue and no leaves. At least that’s what one of the gardeners told me. A witness to the tree painting at the Glasbern earnestly wondered if the dead tree was being treated with a coating that would bring it magically back to life. But no, the magic is not in the paint, nor is it in the tree. It comes from within the observer. It is in the enchanted forest that the elegant blue frame brings to life in the mind’s eye. I hope there will be at least some people who won’t have to ask. *note: this is your chance to use a very serviceable word that most of us have only seen in print! 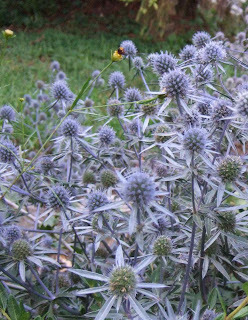 Sea holly (Eryngium planum ‘Blaukappe’) is a gardener’s plant. It flops, it prickles, it attracts swarms of wasps of all species and sizes, which buzz about its steel blue spikes in obvious (to me, anyway) glee. This is a good thing, as the wasps hang around the garden and parasitize pesky caterpillars. I’m a long-time fan of umbels, especially the architectural angelicas and dills, but ‘Blaukappe’ sea holly is the most fascinating of the clan. Now it’s not the easiest perennial to place in the garden. But fortunately, once you get a ‘Blaukappe’ blooming, it’s a simple matter to audition it in different spots. Cut the spiny sprigs after the blue fades to gray and toss them around. Late in the season I like to play the role of the flower fairy, plucking dried flower heads of various self-sowers—larkspur, sunflowers, woodland tobacco, bells of Ireland. As I envision drifts of purple, shots of yellow, or masses of bristly blue rising up in the spare spots of the garden and rescuing it from blahness, I fling seeds here and there. ‘Blaukappe’ doesn’t bloom the first year, so you have ample time to change your mind about where it should or shouldn’t go. Like a teenage boy (before noon) it likes to relax against or on top of any convenient surface—your patio, your concrete rabbit, your favorite geranium. So you have a couple of choices: you can compel it to stand up straight with sticks and string, or you can embrace its sea-holliness by being understanding about its lax habits, and provide it with something—a rock, a wall, a funky chair painted blue that you don’t mind sacrificing to the cause—for it to lounge on. I prefer option two. Years of trying to make plants, and teenage boys, abide by rules that go contrary to their natures have taught me when the payoff is worth it. And when it just isn’t. Permit me to vent, just once, then I’ll get to the inspiration business. A new client’s garden needed weeding today. I do that, among other services, which do not include shaving shrubs with power instruments, or scraping the ground clean of messy leaves and twigs and then laying down uniform chips of recycled industrial wood. Dismal expanses of this product, available at garden centers everywhere dyed brown (to simulate dirt), black (to simulate wet dirt), and red (to simulate a carpet in a brothel), are a common sight. And no wonder, the stuff can be laid down with big blowers since it has very little moisture, conveniently saving the landscaper from hiring an extra employee or two. As I jimmied out nutsedge and thistle from the vast zones of fungus-free mulch, I didn’t see a single worm or larva. But (says the manufacturer) the non-fading color gives the landscape “eye-catching curb appeal.” So. Where do we even start to teach homeowners that decorator colors applied four inches thick do not a beautiful garden make? And that it matters. It matters that it will take years for earthworms to digest dried, chipped pallets. It matters that threads of mycelia have important functions in the food and decay chains. It matters that when pine needles fall under pine trees, there are good reasons to leave them there. It matters that we respect polycultures of all kinds, that we embrace fading as a sign of maturity, and that we value the beauty of a complex, well-functioning, vital system over the temporary satisfaction of tidiness. It matters that cicada killers have a place to call home (ok, truce). If you’re already addicted to the brown, black, or red stuff I can help. Just for one year, mulch with straw. Only straw. It will fade to a lovely umber, feed your worms, and (if you look really close) make the world a beautiful place. Plus, it will save your back. The photo is of my (mostly) straw-mulched garden. Welcome to my garden, and meet my cicada killers! Why does the world need another garden blog you might ask. Short answer: it doesn't. After five years testing vegetables and flowers at the Organic Gardening test garden in Emmaus, PA, and many seasons of making properties beautiful with limited time and resources, I have morphed into a garden coach for friends and clients. Adopting the title merely makes it official. Some of the challenges I face in Pennsylvania may be familiar, some of the solutions, applicable. I love what I do, love to share what I learn, and especially love to learn from my and others' garden experiences. 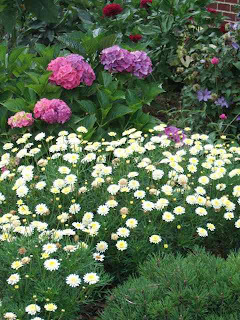 My main interests: plants that solve landscape problems, winning combinations, great new plants, insect solutions, how to build better soil, and of course, shortcuts to creating beautiful gardens. 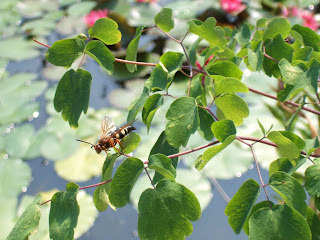 Here is this week's challenge: the cicada killer wasp. It is a beneficial, mild-mannered but monstrous critter that wants nothing more than to drag cicadas into its underground lair to nourish its offspring. This summer I've resolved to swat every one I see burrowing into the sides of my pond with a tennis racket. Heartless, yes. Ecologically incorrect, yes. But I have watched in proper fascination for two years as the soil has been unearthed from below my steps, and mounded on my 'Kent Beauty' oregano. The steps have sunk, the oregano has suffered, and I've dodged the amorous monsters as they've swooped and raced about me on my way from house to car. It's time time they found somewhere else to live. My clever plan is to leave the carcasses in plain view for their companions to see. Will this deter? Check in later to see. Yesterday I swatted three!